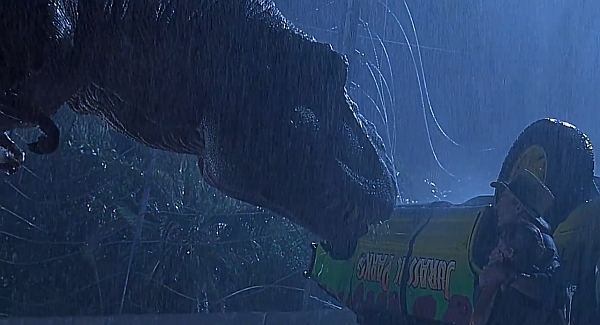 In the T-Rex scene in Jurassic Park, our hero eats the goat and then she breaks the wires on the passenger side of the vehicles. 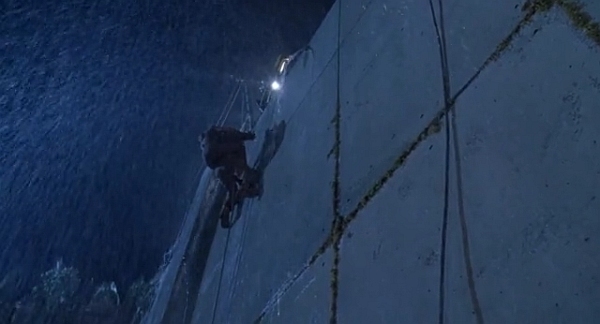 However, when Dr. Grant and Lex rappel off the edge of the cement in the breakthrough, they are still on the same passenger side of the paddock. They drop through the same broken wires. However, this is much, much higher than the T-Rex - not to mention the goat. Is this just a film blooper or am I visually missing something? 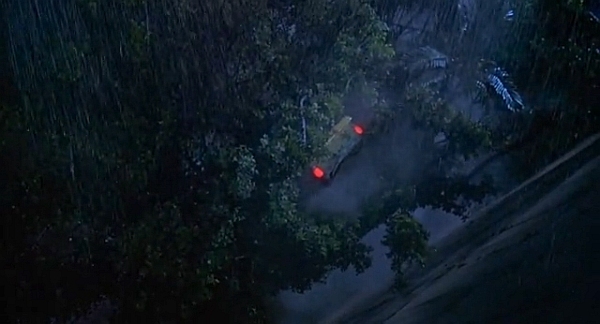 Often incorrectly regarded as a goof is the fact that when the Tyrannosaurus exits her paddock from ground level with the road, there's the sudden appearance of a cliff when she pushes the car over it. In reality, there is in fact a cliff that acts as a natural barrier for the Tyrannosaurus, otherwise she would be able to exit her paddock through the gap between the fencing and the tunnel with ease. The diagram on the right illustrates what happens. 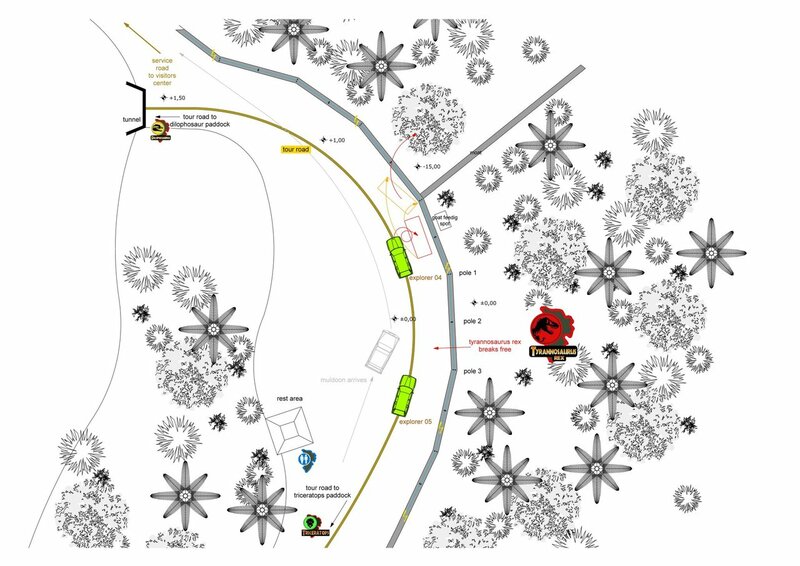 In cde's answer we can see a map from the Jurassic Park Wiki, but no source is given for that map, so it's unclear to me how "official" it is. 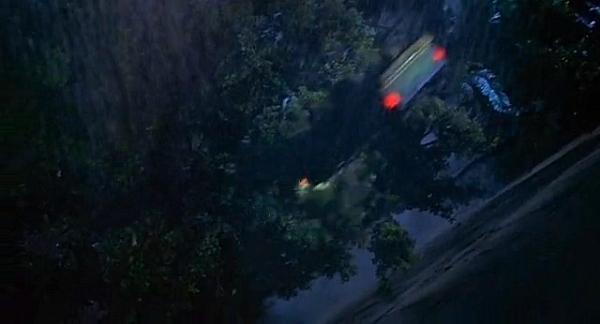 We see in the movie that the vegetation is pretty close to the fence. Because the attack happens at night, it's sometimes difficult to see, but in several shots we can see vegetation right behind the fence. 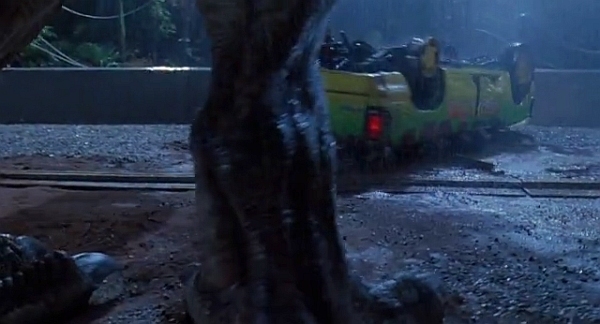 I guess the explanation from the Jurassic Park Wiki (see cde's answer) is the best we can get, but given the shots where we see the vegetation close to fence I do think the filmmakers messed up a bit. There are some continuity issues in the movie, and this is never explained. However, in the book it's explained that all the paddocks have moats surrounding them as an additional measure of security. Presumably, that drop is part of the moat.